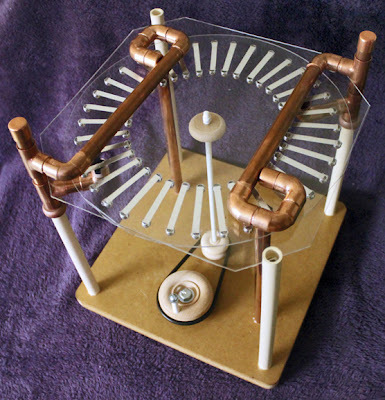 I just finished building a Dirod model #8 electrostatic generator and the air is filled with crackling ozone. 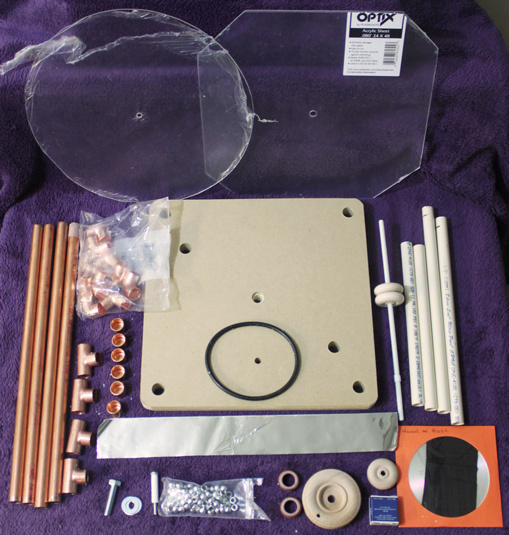 The kit is virtually complete. All you need is some glue, paint, tape, and common tools, plus a tubing cutter. The suggested glue is "Plumbing Goop" and it works very well. It's basically a slightly less viscous version of the old "model airplane glue" that frustrated many a plastic model kit builder back in the Good Old Days. It's plastic dissolved in toluene and other petroleum distillates. As the solvent evaporates the solid plastic is left behind. Its only drawback are the fumes. I had to glue the beads on outdoors—but I'm getting ahead of myself. To make sense of the following tale it would be a good idea to download the instruction manual here so you can follow along. After checking to make sure that all the parts were were there and printing out the instructions it was time for step 1: painting the base. Not only does this make it look better but it also reduces corona discharge from the base. This is where the mistakes began. Being in a hurry, I bought a spray can of polyurethane. It worked great on the surface of the MDF but the edges soaked it up like a sponge. I never even got to the bottom before I ran out of paint. If I could do it over again I'd probably use some kind of sealant first, then put the clear coat on. You shouldn't use metallic paint as that would defeat the entire purpose of painting the base and black is also a bad choice because the pigment is carbon. At the high voltages the Dirod generates carbon conducts really well. It's a shame because the sparks would really stand out against a dark background. My second and biggest mistake was not making a key observation at the start: the corona shield should be exactly 11.5" from the bottom of the base or 10.75" from the top. This determines the precise height of the components that support it. I didn't realize this until after I started running into trouble and emailed the manufacturer of the kit for help. Fortunately the amount of slop in my finished Dirod is only about .125" and doesn't seem to affect its operation. But I could have done better. When building you own Dirod use this dimension for fitting the support posts and collector tees. You'll save yourself some hair-pulling later. As per the instructions I removed the lettering from the white CPVC pipe with acetone. There's lettering on the copper pipe as well but I didn't want to use acetone so I tried Goo-Gone instead. It took some elbow grease but it worked and the tubing was nice and clean when I got done. The CPVC pipe was pre-cut to size so that part was easy. Except that I didn't glue them the right way (they twisted right back out of the holes) so I had to redo them by putting some glue around them above the base and shoving them back down. As I already mentioned, I didn't realize that the two corona shield supports needed to have their slots exactly 10.75" above the base so they ended up being different by almost 3/32". The slop had set in. At least I managed to glue the main bearing to the shaft without getting glue in it. The first stage of building the collectors also went without untoward incident. Then I made yet another mistake. The instructions said something about gluing the collectors to the corona shield but this didn't really jump out at me. I couldn't tell from the photos so I assumed I could do it later if necessary and forgot all about it. Of course it turned out later that I was supposed to glue the collectors to the corona shield. I moved on to preparing the disk. First I had to cut 36 strips of pressure-sensitive aluminum. Having worked in a graphic arts studio before I knew to make the long cut first and the short cut second. Having the artist's friend, the cork-backed ruler, helped a great deal. 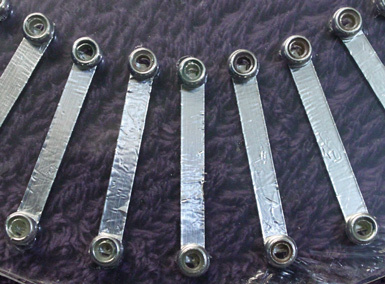 I found a fast way to mark and cut the 36 aluminum tape strips used for the "rods". I had a scrap piece of 1/4 inch thick aluminum plate, with a straight base about 4 inches long. Setting the base cross-wise on the aluminum tape, I marked the 1/4 inch width, Then I flipped the plate on its side, and used the long edge as a guide for cutting the tape at the marks with a hobby knife. Whichever way you do it make sure you have a sharp, brand-new blade in your X-Acto knife. A dull blade will snag and tear the material. And don't use a plastic ruler unless you're never going to use it for anything again. Now it was time to apply the aluminum strips. It's almost impossible to get them perfectly placed but "close" is good enough. Here's an old artist's trick: peel off a short section of the backing paper and place that end on the Plexiglas. Line up the other end by eye and slowly pull the backing out from under the strip, smoothing the strip down along its length as you go. This works much better than peeling all the backing off and then trying get the strip into place. Note that the aluminum has creases in it that won't smooth out and you can't get them absolutely perfectly aligned so don't sweat over that. Gluing the beads on is the real hair puller. I had to do this outside because of the amount of Goop used. It would have stunk up the entire house up if I hadn't. It's also a very messy job. I tried to using a pair of pliers but quickly gave up on that approach. This is a job that has to be done by hand. I ended up getting a lot of glue on my fingers and the wind almost blew the beads away a couple of times but I got it done. Be sure to press down firmly on each bead after placing to make sure it was seated properly and not just hanging on by one tiny spot of half-set glue. Next, assuming that I had the corona shield all taken care of, I installed the foil on the bottom of the base and glued the neutrals into place. It was when I tried to put the corona rings on the short pieces of CPVC that I ran into trouble again. It was very difficult to get them started on the pipe and moved down far enough for the tees to fit. It took some very tense moments to get them into place. You might want to partially ream out one end of both rings to make it easier to get started. Why is this thing so crooked? What's supposed to hold the corona shield up in the right corner? I was really baffled. You can see that I put a rubber band on the copper pipe to level out the corona shield and that the bottom of the tee is well above that height. I still hadn't realized that the collector was supposed to be glued flat onto the corona shield. It took a couple of emails back and forth with Kevin to figure all this out and I was rather depressed for a couple of days until the solution became clear. Let me stop here and repeat myself. Make sure the corona shield is supported at a height of 10.75" above the surface of the base at all four corners. The 1" pieces of pipe between the two tees (as per the instructions) were actually about .125" too long for to get the collector tees to drop down to the correct height. Of course your Dirod may turn out slightly differently. The only way to be sure is to carefully measure everything as you're building it. I double, triple, and quadruple-measured everything before I made each cut and I still got it wrong. Once the glue had set I ran into another problem: the hole in the disk was too small for the shaft. I tried rounding the shaft off but it still wouldn't go through the hole. I measured the hole and shaft with calipers and found that the hole was 1/64" smaller. I ended up reaming out the hole by hand with a .25" drill bit. Fortunately this wasn't too loose. I spent quite a bit of time playing around with the height of the disk and trying to level it out. In end I just went ahead and glued the wooden wheel to the disk but not to the shaft. Once the glue had set the disk ran almost perfectly level and I was able to move it up and down to find the correct height for it. I put glue on the shaft, slid the disk back to the correct height and held it in place with a clothespin while the glue set. The last step was to add the brushes. I taped them on with Scotch Magic Tape, taking care to fold over one end of the strip so I could easily remove and reposition the tape until I had the brush height just right. I gave the disk a spin and it started crackling immediately. 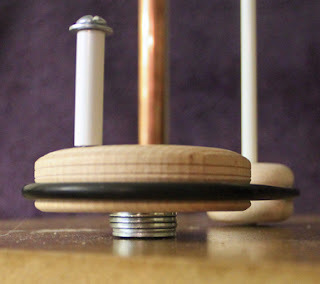 And I discovered one final problem: The groove in the crankwheel doesn't line up with the "pulley" on the shaft. This made it hard to keep the belt from running out of the groove. It was also hard to turn the crank because it tilted slightly on the bolt and there was a great deal of friction. Fortunately the solution to both these problems was ridiculously simple—I added three more washers under the crank. Now the belt is perfectly aligned and almost all the friction has disappeared. I can spin the disk much faster than is actually needed. And that's all there is to it (he said knowingly). 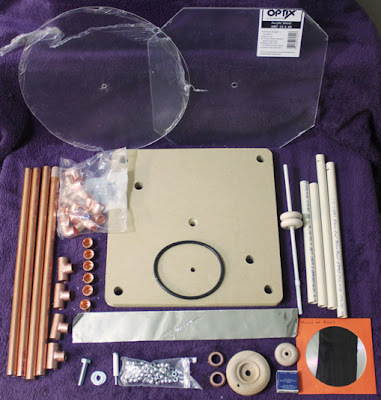 For some further musings on building a Dirod #8 and electrostatic motors see Harold Leinbach's page. I'll be exploring that and other things in a later post. Very neat, I had never heard of a Dirod before. Youve got me interested now I'll have to look around for some info. Thanks! Well done mate. How long is the spark you achieved with this build? With the rod gap 1.5". With a ball gap .75" (much louder snap) I'd put the links to the posts (which have pictures) here but they don't display properly in the comments. Search the site for "Dirod". I'm a bit puzzled by the need to use non- conducting paint for the base. It is well away from the generating area, and is made of MDF, a conductor. Any spark capable of jumping to it should penetrate a paint film easily. furthermore, while operating, your hand (a good conductor)is closer to the high- voltage areas than the base. Tony: I'm a bit late answering your question as I never received an email when you posted it. 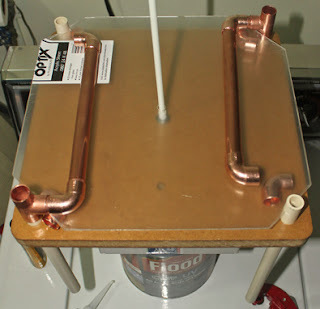 There's a conductive strip on the bottom that joins the two vertical pieces of copper tubing. The instructions advise painting the entire base just to be safe. I'm not an expert, I just followed the advice to be safe. YMMV.